If you have been burnt by the church, Love Big, Be Well, just might restore your faith in the body of Christ (family of God) aka the church. This novel is the story of Pastor Jonas McAnn whose decided to get back into preaching after doing a stint working at an insurance company. He receives a letter from one of the churches he’s going to be interviewing at. He’s used to getting a long list of questions, but the letter he gets is down to earth and simple. Does he want to be Granby’s pastor? Pastor Jonas writes back. This starts a tradition of correspondence between himself and the congregation. Him and his wife decide to accept the pastorate at Granby Presbyterian. This novel is the correspondence over the years between Pastor Jonas and his new congregation. Each chapter talks about different topics from Advent, to baptism, death, Christian conferences, friendship and a host of other topics. This novel isn’t preachy, it’s not superficial. This book is down to earth and meets you where you are at. You don’t have to be a believer to read this novel. 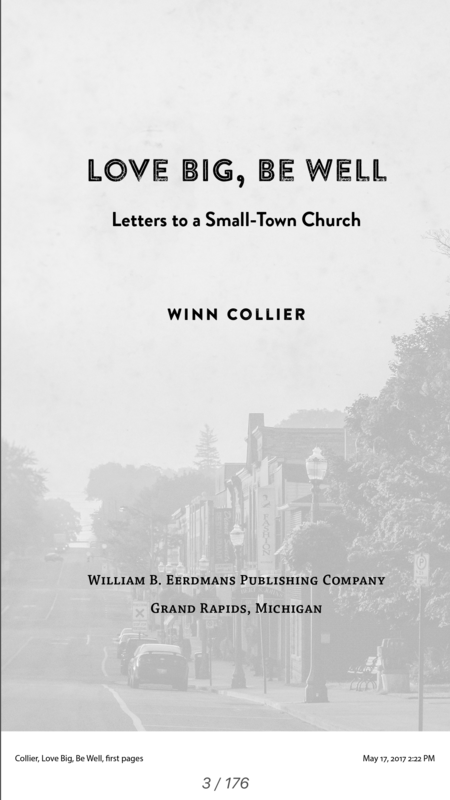 I received the e-book ARC of, Love Big, Be Well by Winn Collier from NetGalley in exchange for my honest assessment. This book reminded me a lot of the book, So You Don’t Want To Go To Church Anymore, by Wayne Jacobson and Dave Coleman. Both books are sweet and tackle tough topics in a nonpushy manner. If there is a church out there like the fictional Granby Presbyterian sign me up. I miss belonging to a church family like that.